If you ever wanted to get a Bougie Black Person's attention and you weren't sure how, a surefire way would be to mention the snarky "Death Rides A Pale Horse" cover The Roots did on Fallon the night before. If you want that Bougie Black Person to smile, mention that time you saw The Roots live at SXSW a couple years ago. If you want to impress them, mention that the concert was free. And, if you want them to want to be your friend, mention that time you ran into Questlove in a mall elevator in Coral Gables. Although Bougie Black People love The Roots, this love pales in comparison to the adoration they feel for Questlove, who's joined 2008 Obama, 1959 Sidney Poiter, and 1852 Frederick Douglass as the only men to have a 100% Bougie Black approval rating. To understand why Bougie Black People love Questlove so is to understand Bougie Black People. Bougie Black People are preternaturally obsessed with famous rappers who make rap songs but don't rap anymore. This shows the artist is "evolving" and "changing" — concepts Bougie Black People love because they too feel like they're "evolving" and "changing." Into what? Something, perhaps. Naturally, they'd feel a connection to a hip-hop artist who began his career already evolved past the point of rapping. While their jobs as "Regional Federal Diversity Initiatives Operatives Assistant Co-Manager" and "Urban Beekeeper" don't always allow them to show off their intellectual chops, the thinkpiece gives them that opportunity, either by asking their friend at The Root to allow them to write a 900 word juxtaposition of Ray Rice and George Costanza or reposting an already published thinkpiece on their Facebook walls, under the caption "Exactly!" Questlove's intellectual chops were already cemented when naming an album after a book (Things Fall Apart) every Bougie Black Person pretends to have read. So his occasional thinkpiece writing is purely a labor of love that all Bougie Black People can appreciate, like mentorship or recycling or dating a Zeta. Something every Bougie Black man can relate to, since every Bougie Black Man has never been more popular in his whole entire life than he is right now. Which matters because The Broke Diaries is the post-grad Bougie Black girl's Bible. There are two types of Bougie Black men: Those with awesome beards, and those who hop from barber to barber looking for one who might be able to trick people into thinking he has an awesome beard. 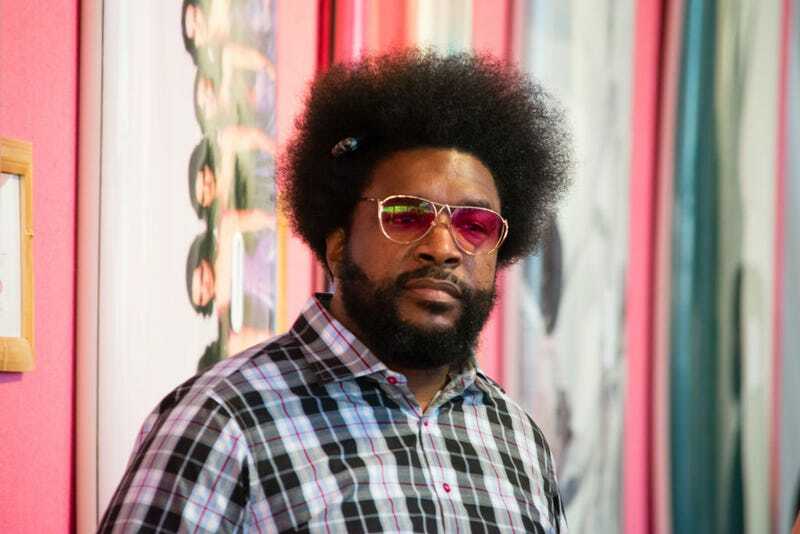 Naturally, you'd think this would inspire a bit of beard envy-fueled hate towards Questlove, but the love for Questlove is so deep that his beard has become a signpost, an aspiration. So if you did really happen to run into Questlove in a mall elevator in Coral Gables, make sure not to forget that story. You might need to get into a Day Party one day, and having a Bougie Black friend will surely help.